Jeeps are known for their rugged construction. These All American vehicles will take you up mountain roads and through muddy streams, but it’s just as common to see them at your local grocery store. No matter how you use your Jeep, your driving machine deserves to stay in strong running condition. Menke’s is specially equipped and fully trained to keep your Jeep prepared for the next adventure. Grueling driving conditions can wreak havoc with your Jeep. Menke’s expert technicians are prepared to counteract off-roading conditions and maintain your vehicle for continued safe driving. Stay in factory new condition, and prepare for the next round of abuse. Each of our technicians is ASE certified to service your Jeep. This enables us to give you high quality service with a quick turnaround and ultimate reliability. You can trust our experienced staff to give you “better than dealership” service. Menke’s is dedicated to keeping our customers happy. We’ll explain any repairs we’ve made and answer whatever questions that you might have. We also know how inconvenient it can be to go without your vehicle while it’s being repaired. For that reason we provide a free loaner car for your use during the time your Jeep is in the shop. Relax in the homelike atmosphere of our waiting area, and enjoy our flatscreen TV, free WIFI, and comfortable seating. 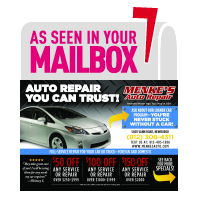 Menke’s is honored to have been recognized by Motor Age as the “Top Shop” out of 165,000 auto repair shops in the US, and to have won a Facility of the Year award in 2014. Using only the latest in diagnostic tools and service equipment, we provide superior vehicle service. Each of our spotlessly clean bays is equipped with a computer for online ordering and research. Daily morning staff meetings and regular staff training in current methods keeps our employees updated in the newest technology. Our policy will continue to be “satisfaction guaranteed” to each of our Jeep customers. Not enough to convince you to choose Menke’s? How about our Angie’s List Gold Award for Super Service, our Best Dressed Shop Award, or the fact that we’re the only AAA Approved repair and service facility in the area? Just more reasons why we’re leading the way in automotive repair.